When we started out on the cloth diaper route, our daughter was 2 weeks old we fell in love. We loved the easiness, the cuteness, and even the savings! Time went by and we were starting to gear up to go on our first real vacation. In the weeks prior, we talked about how we needed to buy disposables and both of us just hated the idea but didn't know how we could pack everything we needed and how to wash them. That's when we learned about Flip Diapers! Flip Diapers is a great hybrid diaper that we could use Flip disposable inserts as well as the cloth insert. As we read all about it, we thought about all the future trips we'd take and realized we could use them on day trips or other vacations. We took the leap and bought a few Flip Diapers and a package of disposable inserts. one bumGenius 4.0 diaper for nighttime and just enough inserts for the nights. The detergent was to wash covers by hand in the sink for the overnight, and if any of the covers got dirty. Hand washing was super easy. After we changed the little one, I took the inserts out, rinsed them out and tossed them in the wet bag to wash when we got home. I then washed the cover and hung that on the shower to dry for the next night. Every night, I checked the covers and if one was dirty, I washed and hung it to dry for the next day. Granted it was a little more work tossing dirty disposable diapers in the trash but in total it wasn't more than a few minutes of my time. What we loved about it all was the ease of it all and how adorable she was! We got a lot of compliments on how great it was we were doing cloth on vacation. We even met another couple who were afraid of trying it on vacation but after we told them about it, they were going to do it for their next trip. 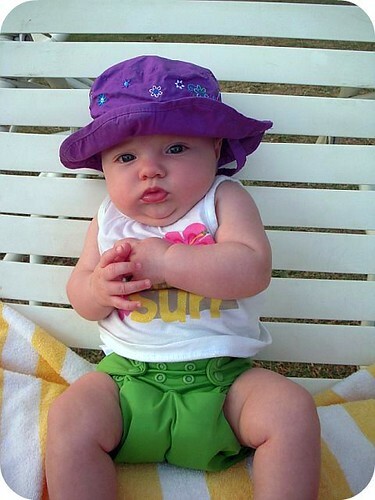 Have you traveled with cloth diapers? If so, what are your tips to travel with cloth diapers?